Township yoga. It sounds fairly self-explanatory; after all, people practice yoga everywhere. Why not in the townships of South Africa? 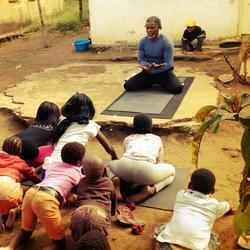 However, the Township Yogi Project is much more than just yoga. Screenwriter and producer Elle Matthews, head of the independent production company Green Shoot Films, had an epiphany two years ago after going to a yoga retreat in Thailand. Matthews, who lives in Durban, South Africa, asked two yoga instructors if they would join her in bringing yoga to three townships: Inanda, KwaMashu, and Ntuzuma, which are located in the province of KwaZulu-Natal and suffer from a high level of crime and illness. The project began with volunteers teaching yoga at the Ohlange Institute in Durban—the place where Nelson Mandela cast his first vote. According to Media Club South Africa, the classes were held in AIDS clinics and community halls. After starting small, the project quickly expanded, and aims to continue expanding. It has reached into northern KwaZulu-Natal, and Matthews tells Media Club that she plans to bring yoga to the notorious Soweto in the next few months and Cape Town later this year. Matthews explains that the project not only provides classes to everyone from children to grandmothers, but also trains people in the community to become yoga instructors. Four local men received their certification as yoga teachers in late 2013; the project’s Facebook page tracked their progress, allowing the public to see the human faces behind this initiative.